The various participants were made up of 10 youths from the United Kingdom, 11 from Czech Republic, 3 from Switzerland and a further 2 from Slovakia. Additionally there were 5 adults on hand. The busy schedule was a mix of practical training, public performances and very detailed internal guidance concerning the meaning of purity, living such a standard, preparing oneself for future marriage, facing challenges, overcoming temptations and how to be able to become an example for all young people. In the Czech Republic WAIT members are mostly individuals who had joined as a response to ‘pure love’ lectures that had been giving in their schools. One girl became involved on the recommendation of her friend, another had been so impressed with last year’s performance that this year decided to join the WAIT team and one boy even came as a result of a member’s driving mistake – the policewoman who intervened had been searching for something worthwhile that her son could belong to! 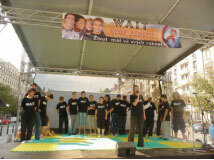 In all there were sixteen public performances and there was individual discussion about the project with some six hundred people, half of whom received a Purity Pledge to support making good choices in their lives. Two performances were given in a prison where the WAIT team was very warmly welcomed by an audience of seventy young women and girls who were inside mainly for crimes related to drugs or theft. The performances had the effect of providing the young prisoners with a message of a new beginning in their life. In the end they were dancing together with the WAIT members and a wonderful atmosphere was created. On another day the parents of WAIT members were invited to a performance where the meaning of the project and its benefit for their children was explained. One of the Czech members is currently preparing for marriage and her parents are very supportive of the aims of the WAIT project. Being part of the project proved to be a thoroughly enjoyable experience for each of the participants who were able to develop their presentation skills as well as gain a deeper understanding of the value of pure love. They found it particularly rewarding to be able to provide something beneficial for others as well as the experience of good team work.